Chairman Caroline speaks! Peter asked me to write a few words about the March convention. How can I sum up such a great weekend with just a few words? I'll tell you about my highlights and try to keep it as brief as possible. It was great to see so many people with us, but particularly so many new faces with a couple of uke groups making their first visit. Don't forget that George played a wooden uke too. 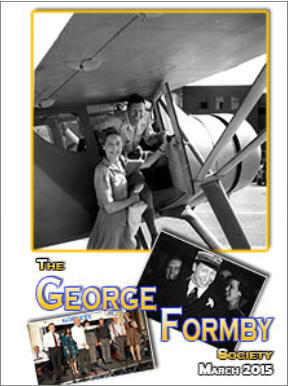 Hopefully they will go back to their friends and tell them all what a great time they had at the George Formby Society and we'll see them all back again in June. Meeting up with our old friends is always really special. There's something quite magical about a GFS Convention. From the minute you arrive you really feel like you are home which is peculiar considering the journeys some people make to be there! We had several friends from Scotland join us with Kate and John Howard making the mammoth journey from the Isle of Skye again. Our Archivist Our archivist, Lewis Clifton did another sterling job and showed off some new acquisitions for the Society in the form of personal possessions of the Formbys. Baby Liam Chenery made his first appearance on stage and decided to steal the show by crying! The President Gerry Mawdsley and 'President of Vice' Peter Pollard opened the weekend with the first performance on Saturday. What a start! 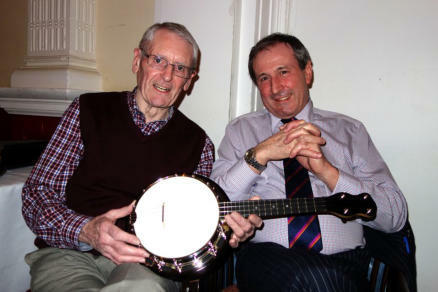 We listened to George's 1926 recording of his fathers song, 'John Willie, Come on', on an old wind up gramophone player. The room fell silent as we heard the acoustic recording crackling through the speakers. Very atmospheric! Ambition Fulfilled Local hotelier, Keith, joined us in the thrash to fulfil an ambition to play Frank on his Tank. Keith had a serious accident last year and we wish him the very best in his recovery and hope to see him again soon. Former Chairman Dennis Mitchell got everyone marching in their seats and waving their handkerchiefs in the air to accompany him in Swinging Along. Great fun! Sunday night saw a bigger than usual audience who have obviously heard what a great time we have. 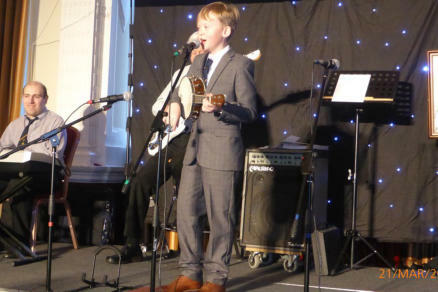 It's my favourite show, not only because I thoroughly enjoyed my duet with my very good friend Peter Pollard, but because of the quality and variety of the performers. 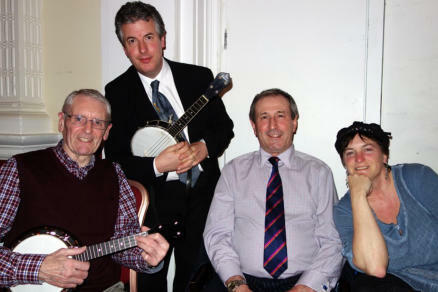 The Frank Randle Society celebrated the renewal of Beryl Formby's memorial stone with a fantastic rendition of Baby. Our dear friend Gladys Geoghegan made my weekend with a brilliant version of the Ghost, my favourite Formby song. Ukulele Trade Stand The committee decided to trial a Ukulele trade stand this time which seemed to work well, despite being located in the busy 'Little Back Room' where of course the lessons are held. There were great attendances for both the Beginners Lesson with Andy and the Up and Comers now run by Daz Barry. Hard Workers There are so many people that work hard throughout the weekend. The committee aren't the only ones to put the hours in. There's the band, concert organisers, shop girls, sound team, stage manager, photographer to name a few. There are too many people to mention but they know who they are and I'm sure you do too so next convention give them an extra smile to say thank you! I for one really appreciate their help. We did get the chance to make a fuss of our Musical Director Matthew Richards who celebrated his 27th birthday on Sunday 21st March. His good friends Lynn and Leigh Raybould brought a cake all the way to Blackpool and we all sang Happy Birthday to Matt. Another special occasion on the same day was the 57th Wedding Anniversary of Alan Southworth and his wife Hilda. What a wonderful day for them and how pleased we were to share it with them. I told you there was a lot to talk about. I would like to thank everyone who came along, especially all those who gave a bit extra to make the weekend the success it was. Hope to see you all in June! Caroline Stewart GFS Chairman A few words from Peter It was a great pleasure to take to to the stage to open the weekend with our president, Gerry Mawdsley - and judging by the comments received, it is something that we will repeat in the future. Dave Barnes creates a pre-war Abbott It was also a thrill to finally set eyes and ears on Dave Barnes pre- war Abbott copy that he has lovingly created over the last 2 to 3 years. It is far better made than the original Abbott instruments and Alan Yates did a great job of showcasing the instrument from the Imperial stage. Instrument expert John Croft was over the moon with the quality and sound so Dave can take great pleasure and satisfaction from a task well done. It is not sure if Dave will go in to full production and start taking orders but whoever finally ends up with one of the three that are in existence will have a rare and beautiful instrument. 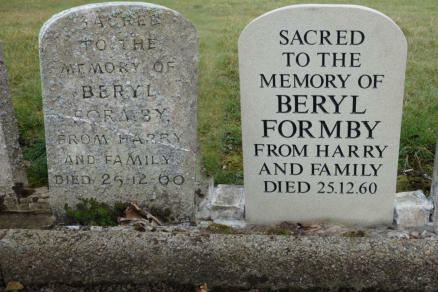 Beryl's headstone And the final act of the weekend (for me) was to make the trip to view the renovated memorial stone that was discovered last year in Lythem Crematorium grounds by Lee Mannering. Put there in 1960 by Harry Scott, the stone is the only memorial to Beryl. Now renovated, it provides the only physical object to the lady who made it all possible. Chairman Caroline speaks! Peter asked me to write a few words about the March convention. How can I sum up such a great weekend with just a few words? I'll tell you about my highlights and try to keep it as brief as possible. It was great to see so many people with us, but particularly so many new faces with a couple of uke groups making their first visit. Don't forget that George played a wooden uke too. 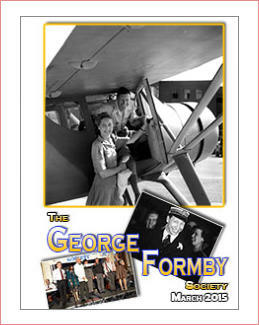 Hopefully they will go back to their friends and tell them all what a great time they had at the George Formby Society and we'll see them all back again in June. Meeting up with our old friends is always really special. There's something quite magical about a GFS Convention. From the minute you arrive you really feel like you are home which is peculiar considering the journeys some people make to be there! We had several friends from Scotland join us with Kate and John Howard making the mammoth journey from the Isle of Skye again. Our Archivist Our archivist, Lewis Clifton did another sterling job and showed off some new acquisitions for the Society in the form of personal possessions of the Formbys. Baby Liam Chenery made his first appearance on stage and decided to steal the show by crying! The President Gerry Mawdsley and 'President of Vice' Peter Pollard opened the weekend with the first performance on Saturday. What a start! We listened to George's 1926 recording of his fathers song, 'John Willie, Come on', on an old wind up gramophone player. The room fell silent as we heard the acoustic recording crackling through the speakers. Very atmospheric! Ambition Fulfilled Local hotelier, Keith, joined us in the thrash to fulfil an ambition to play Frank on his Tank. Keith had a serious accident last year and we wish him the very best in his recovery and hope to see him again soon. Former Chairman Dennis Mitchell got everyone marching in their seats and waving their handkerchiefs in the air to accompany him in Swinging Along. Great fun! Sunday night saw a bigger than usual audience who have obviously heard what a great time we have. It's my favourite show, not only because I thoroughly enjoyed my duet with my very good friend Peter Pollard, but because of the quality and variety of the performers. 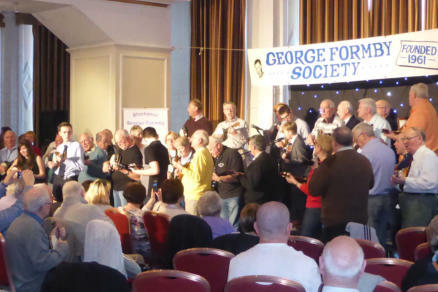 The Frank Randle Society celebrated the renewal of Beryl Formby's memorial stone with a fantastic rendition of Baby. Our dear friend Gladys Geoghegan made my weekend with a brilliant version of the Ghost, my favourite Formby song. Ukulele Trade Stand The committee decided to trial a Ukulele trade stand this time which seemed to work well, despite being located in the busy 'Little Back Room' where of course the lessons are held. There were great attendances for both the Beginners Lesson with Andy and the Up and Comers now run by Daz Barry. Hard Workers There are so many people that work hard throughout the weekend. The committee aren't the only ones to put the hours in. There's the band, concert organisers, shop girls, sound team, stage manager, photographer to name a few. There are too many people to mention but they know who they are and I'm sure you do too so next convention give them an extra smile to say thank you! I for one really appreciate their help. We did get the chance to make a fuss of our Musical Director Matthew Richards who celebrated his 27th birthday on Sunday 21st March. His good friends Lynn and Leigh Raybould brought a cake all the way to Blackpool and we all sang Happy Birthday to Matt. 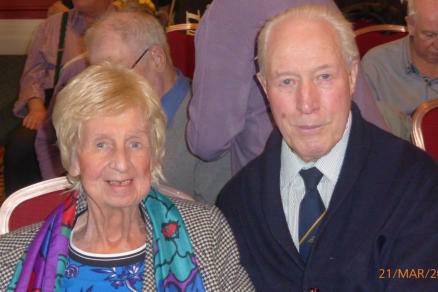 Another special occasion on the same day was the 57th Wedding Anniversary of Alan Southworth and his wife Hilda. What a wonderful day for them and how pleased we were to share it with them. I told you there was a lot to talk about. I would like to thank everyone who came along, especially all those who gave a bit extra to make the weekend the success it was. Hope to see you all in June! 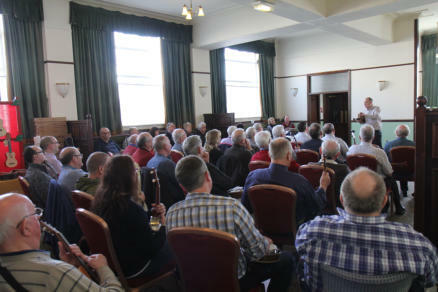 Caroline Stewart GFS Chairman A few words from Peter It was a great pleasure to take to to the stage to open the weekend with our president, Gerry Mawdsley - and judging by the comments received, it is something that we will repeat in the future. Dave Barnes creates a pre-war Abbott It was also a thrill to finally set eyes and ears on Dave Barnes pre-war Abbott copy that he has lovingly created over the last 2 to 3 years. It is far better made than the original Abbott instruments and Alan Yates did a great job of showcasing the instrument from the Imperial stage. Instrument expert John Croft was over the moon with the quality and sound so Dave can take great pleasure and satisfaction from a task well done. It is not sure if Dave will go in to full production and start taking orders but whoever finally ends up with one of the three that are in existence will have a rare and beautiful instrument. Beryl's headstone And the final act of the weekend (for me) was to make the trip to view the renovated memorial stone that was discovered last year in Lythem Crematorium grounds by Lee Mannering. Put there in 1960 by Harry Scott, the stone is the only memorial to Beryl. Now renovated, it provides the only physical object to the lady who made it all possible.